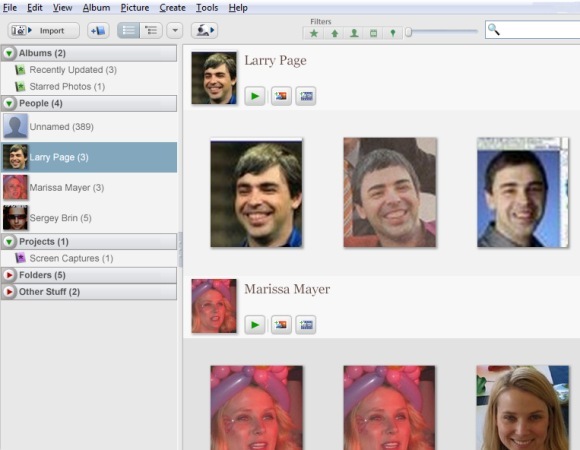 If you liked the feature from Picasa Web Albums that detects the faces in your photos and clusters them, it's now available in Picasa 3.5. Face recognition works locally, without sending data to Google's servers. For some reason, the feature is enabled by default and it starts to process your photos right after installing the software. It's pretty slow and the accuracy is far from perfect: you might see multiple clusters for the same person and different people addded to the same cluster. If you sign in using a Google account, you can choose people from your contacts when you're asked to add names for each group of photos. 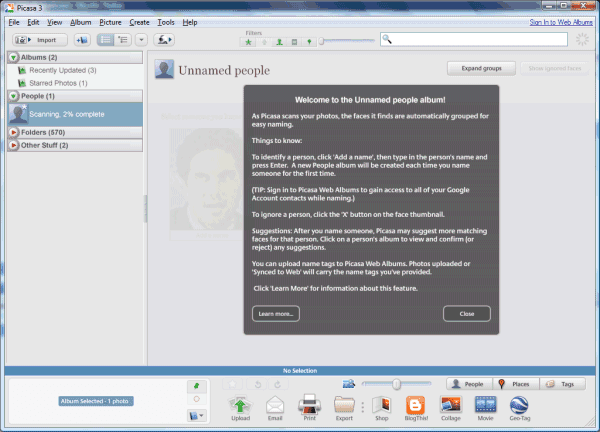 There's also the option to download the name tags from Picasa Web Albums if some of your photos are stored online. "As with Picasa Web Albums, your reward for trudging through your photos to add tags is better organization, which for a massive library of old, archived shots can be hugely helpful," thinks Josh Lowensohn, from CNet. Another new feature in Picasa 3.5 is geotagging using Google Maps. Until now, you had to install Google Earth to add locations to your photos. The latest version of Picasa has a "places" sidebar that lets you drag photos to a map. Three years ago, when Google acquired Neven Vision, a blog post mentioned the goal of the acquisition: improving the way you organize photos in Picasa. "It's not always easy to search through your personal photos, and it's certainly a lot harder than searching the web. Unless you take the time to label and organize all your pictures (and I'll freely admit that I don't), chances are it can be pretty hard to find that photo you just know is hidden somewhere deep inside your computer. We've been working to make Picasa (Google's free photo-organizing software) even better when it comes to searching for your own photos — to make finding them be as easy as finding stuff on the web. Luckily we've found some people who share this goal, and are excited that the Neven Vision team is now part of Google." That's cool but I was expecting support for collaborative albums in this release. How can I get it ? I downloaded it by the link you give at the top of the post, but I keep getting exactly the same release 3.1, after install. I think it's because my system is in French and there is no french release for the 3.5. But I would like to try it, even in English. How can I skip the redirection to French release and download the English 3.5 release ? Thanks in advance for your answer. Thanks ! It's OK now. now all I need is a way of collating my web albums across multiple google accounts (or simply merging into one account)... any ideas? I 'm agree with web design tipperary : we should have it months ago ! And we don't have video importation from Picasa Web to Picasa Desktop (ie : when you computer explodes or when you have a new one ^^). What a huge deception with "Google data liberation" programm :o ! Downloaded 3.5 last night, set it off. In the morning 28% complete. So I'm guessing it's going to take a couple of days to finishing processing all the faces in my photos (25GB worth)? Scary. Wonder how it's with the privacy when you use your friends names from your online contact list. Will google know the name and have a photo on every citizen of the world in the end? And with google I mean the US OF A. Unlike Picasa Web Albums, the desktop client doesn't upload your photos to Google's servers (unless you want that) and the face recognition feature doesn't send data to Google. Disable your internet connection and face recognition will still work. Oh great...someone with a cynical, one-sided and closeminded view of Apple. Just what we needed on CNet.iPhoto is free to anyone with a Mac, which you need to run it. Yes, you have to pay for upgrades but given the life of a computer, you shouldn't have to buy one very often. Also, Apple has zero anti-piracy on it so people can pretty much just take if they have low morals.Do you want me to list the things that Apple has that are free? First if you buy a Mac there is a lot of free stuff that you get. Things are now free that didn't used to be because Apple starting giving them away for free and the industry followed. Like webcams and microphones. What about Safari? Free as a bird to use. It's whether or not you like it or think anything else is better is irrelevant because it is free. You might argue that the "free" things are only free if you buy something else or as a tool to get you to buy something else. That may be true. However, how is Picasa paid for? Google makes money off ads and makes a lot of money. Nothing is "free". It's free to you but you are paying for it in another way. The problem persist. All your friends may still tag you in their photos and upload them to google. Thus the identification system will grow and have information about everybody. Thanks alot to Alex Chitu for the link and also to Katryne for the excellent observation, Picasa 3.5 works for me now. About the big brother, here is a huge field for working out alternatives: http://www.thezeitgeistmovement.com/. Cheers. it's kinda scary, actually. I had a pic of my friends at a pizza party, and it targetted the face of some random pizza counter dude, and he looked like one of the bad guys from Mission Impossible. I also have some faces it missed, is there any way to get it to recognise them?